Location: 5 River Technology Park, Riverside, Keighley BD21 4JP. Museum open day operating a free Heritage bus service linking Keighley Bus Museum, Keighley Railway Station. Keighley Bus Station, and Keighley Town Centre. 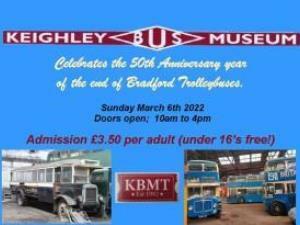 In conjunction with this event, KBMT are pleased to announce we will be operating a free bus service linking the Museum with the Keighley model rail club at Ingrow on the day. Also in the Museum will be Transport related stalls, refreshments and toilet facilities.